Who came up with idea for the word leitmotif? I like words. Alot. But that one, in particular, always confused me. Of course learning that it is derived from the German leiten (to lead) and motiv (motive), it makes perfect sense. But I failed miserably at German I in college (I thought switching from French to German was a good idea because?) so without the help of Mr. Merriam Webster, I would have still been in the dark about that one. Have you noticed any of the themes that run through my kitchen? There are several leitmotifs hiding here at BAH. Fast and Easy are probably the most obvious. But if you poke around enough, you’ll see that I often try variations on a recipe. So today I present you with another tuna experiment. I liked the first one so much that when I saw this recipe, I kind of bumped it towards the top of the test pile. If I had to put them side by side and rate them, I’d say that I’d take the spice rub from Jason Wilson’s recipe and marry it with Rick Bayless’ spicy dressing. There’s something about the heat from the chile and the sweet of the honey that really make the dressing sing. Even The Mistah commented that it had lots of flavor, giving it his highest accolade of “very tasty”. I didn’t use the pumpkin seeds that the original recipe called for. And I adjusted the amount of oil that I added to the food processor to about half of what was in my skillet after the garlic and chile had been cooked. Wanting to get as much heat as I could out of my chile I still didn’t have jalapeno so I used a small red chile instead. I really should find out what kind it is, I opted to leave the seeds with the pepper. I don’t know if this was the reason that my infused oil had a slightly scorched taste. To try and balance it, I added extra honey and lime juice. Next time I’ll consider leaving the chile seeds out of the mix. And it made more sense to me to prep my lettuce and mango before starting on the dressing. I didn’t have any avocado but if I did, I probably would have waited until the tuna was resting before slicing it up. Place a small skillet over medium heat and add the oil, garlic and chile. Cook for approximately 8 minutes, stirring frequently, until the garlic is soft and lightly browned. Scrape the oil, garlic, and chile into the food processor. Add honey and salt and process until smooth. Taste and adjust seasoning as necessary. Rub the tuna with a bit of sesame oil, salt, and pepper. 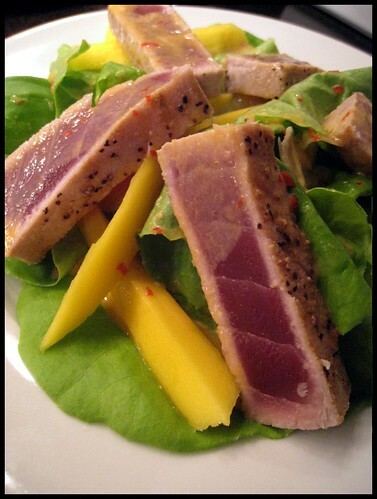 Sear tuna over medium high heat in a skillet or on a grill for 1 minute on each side. The tuna should be pink in the middle and cooked just around the edges. Let rest and then slice. Divide the lettuce among 4 plates. Top with avocado and mango slices. Place tuna on top and drizzle with the dressing. Thanks for the recipe. It looks delicious. Sandy, I hope you’ll give this a try and let me know how you like it. Oh, that looks amazing! Great photo! Hubs would kill for that salad! The dressing was out of this world. I’m not usually a fan of spicy things but I could not get enough of this zesty dressing. Note to self, make more soon because it would be just as good on a lunch salad as it was on the tuna. Sure will- Visit my site. I’ve got a good breakfast recipe on it. It’s not as healthful, but yum yum. And, you’ll have a laugh or two. the salad looks divine and the drewssing sounds wonderful. the tuna is lost on me. too much fish on Friday when I wa a kid and Catholics were Catholics LOL. the spouse would be in tuna heaven! Emily, this tuna is NOTHING like the fish you may have suffered through growing up Catholic. It is the next best thing to a nice rare steak in my opinion. Just be sure to use high grade tuna. The funny thing is that I love raw tuna like this but I can’t stand sushi. This looks heavenly! I almost bought Tuna at the supermarket 2 weeks ago- it was on sale and looked so pretty- but I chickened out. I mean, I like sushi, but something about raw tuna always freaks me out. One day I’ll be daring enough to try this. That’s funny because I hate sushi but I love this. I buy the precut tuna from the sushi counter at Wegman’s. They don’t carry sushi grade at their seafood counter for some reason. Something light like this is a perfect Post Thanksgiving meal. Actually, it would make a pretty super appetizer or main course for a turkey free Thanksgiving.